In 1996 Dr Andrew Thomas became the first Australian to take part in a space research mission. After an extensive career as a mechanical engineer Dr. Thomas was selected by NASA in 1992 and reported to the Johnson Space Center for training. In 1993 following one year of training, he was appointed a member of the astronaut corps and was qualified for assignment as a mission specialist on space shuttle flight crews. In 1996 Dr Thomas was assigned as a Mission Specialist on STS-77, a nine-day mission aboard Space Shuttle Endeavour during which the crew deployed and retrieved a science satellite and conducted experiments in the Spacehab Module. While awaiting space flight assignment, Dr. Thomas supported shuttle launch and landing operations as an Astronaut Support Person (ASP) at the Kennedy Space Center. He also provided technical support to the Space Shuttle Main Engine project, the Solid Rocket Motor project and the External Tank project at the Marshall Space Flight Center. 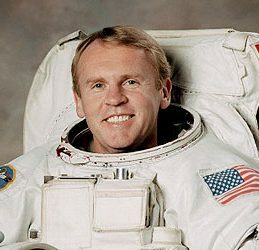 In June 1995 Dr. Thomas was named as payload commander for STS-77 and flew his first flight in space on Endeavour in May 1996. Dr Andrew Thomas then trained at the Gagarin Cosmonaut Training Center in Star City, Russia in preparation for a long-duration flight. In 1998 he served as Board Engineer 2 aboard the Russian Space Station Mir for 130 days. From August 2001 to November 2003 Dr. Thomas served as Deputy Chief of the Astronaut Office. Dr. Thomas completed his fourth space flight on STS-114 and has logged more than 177 days in space. Dr Andrew Thomas retired from NASA in February 2014. He is a member of the American Institute of Aeronautics and Astronautics. His presentations incorporate his experiences, education and views on space research.